To celebrate being done with work deadlines, I treated myself to a lox sandwich from Queens Bagel in Edae on Saturday. I'll have a longer post about this place later when I am able to try something else there. The bagel at Queens is always good. Nothing like a "bagel" from Paris Baguette. 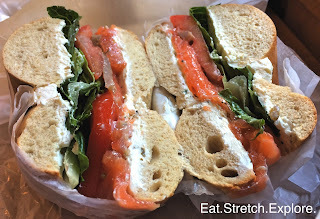 Saturday's Lox Sandwich wasn't as good as it usually is, but still hit the spot. They make the sandwich to order. It's only available from 11AM-4PM for lunch, or until supplies run out. If you order it in Korean, just call it the 연어 샌드위치, it'll make everything so much easier for everyone. If you're not familiar with lox, I definitely recommend trying it. It's brined and smoked salmon. The day I ordered it, I guess some of the staff was new, which is why the sandwich kind of fell apart as I was eating it. At just 6500KRW, you really can't ask for much more. Unfortunately, you cannot change the bagel flavor or the schmear flavor. It comes with plain cream cheese and a plain bagel. I tried to change mine to multigrain, no go. Make sure you eat it soon after ordering, the guy will warn you of this after you order. They have about 7 flavors of bagels that the bake in the store fresh and about 20 different flavors of cream cheese. Their cream cheese is also made fresh in-house. There are NO seats inside, it's strictly takeout. On a nice day, you can take it and eat in Edae campus, otherwise try and find an area cafe and eat it. On Saturdays, open from 11AM-5PM. Closed on Sundays! Even if you go at a seemingly strange time, you'll probably have to wait a bit. After you order, the guy will ask you about a point card. Make one! Then, give him your name and wait off to the side for your name to be called. This may be one of those "Starbucks names situation," so maybe have a Korean name that you use for your order. From Ewha Women's University Station (line 2) exit 2, walk straight down the hill to the main gate. Queens Bagel is right across the street from the main gate.